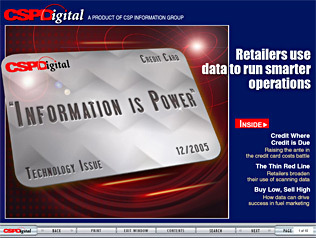 Welcome to CSPDigital's Technology edition, a special-edition online magazine focusing on the Technology category. Credit Where Credit is Due: An update on NACS' efforts at controlling skyrocketing credit card fees. The Thin Red Line: How some retailers are making the most of their scanning data. Buy Low, Sell High: New technology tools help retailers make the most of the volatile fuel business.